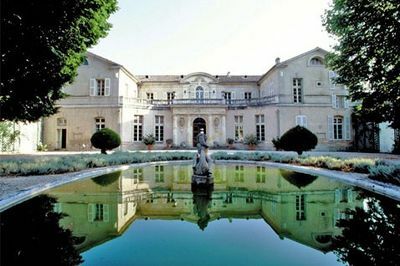 Chateau du Martinet is an authentic château in the heart of Provence just outside Carpentras. Built in 1712, burned during the French Revolution, it was re-built in 1846 in part with stones from the city walls of Carpentras. With its 90 acre / 35 hectare estate, the chateau belonged to only two families before the arrival of Francoise and Ronald de Vries. In fully refurbished and air-conditioned luxury suites and guest rooms, you can enjoy modern comfort in historic surroundings, with direct phone lines, high-speed Internet access, satellite television and a private bath in each suite and room.